On January 14 2017, IBF Super Middleweight Champion James “Chunky” DeGale (23-1, 14 KO’s) will take on WBC Super Middleweight Champion Badou Jack “The Ripper” (20-1-2, 12 KO’s). This will be a unification match for the IBF and WBC 168 pound titles, and will be live on Showtime Championship Boxing. The venue for this bout is yet to be determined, but rumor has it that it will take place at the DC Armory. Since this is a fight between the #1 and #2 Ring contenders, the vacant RING title will also be on the line. DeGale has pulled out his last two victories, but had a rough go of it. Lucian Bute and Porky Medina both gave DeGale a run for his money. Jack has had a rough three fights in a row as well. He squeezed out a Majority Decision against Andre Dirrell back in April 2015, a split decision against George Groves in September 2015, and a Majority Draw against Lucian Bute in April 2016. This is a very even matchup of skill sets, and both fighters have been struggling lately. Its about time this fight was made. Better late then never. 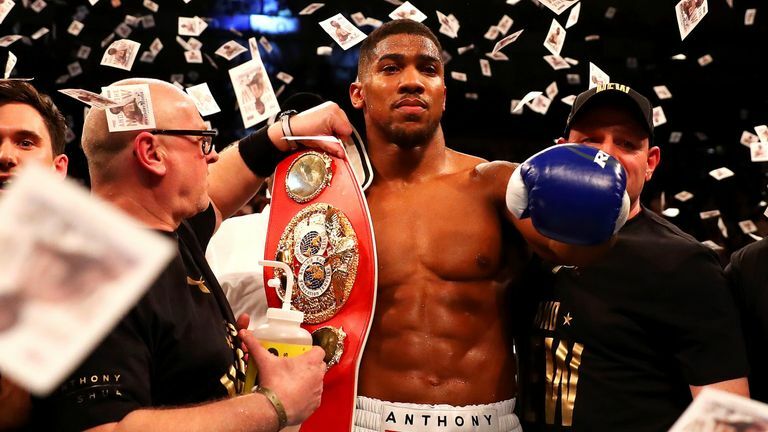 Anthony Joshua (16-0, 16 KO’s) defeated Dominic Breazeale (17-1, 15 KO’s) last night via KO 7th round, and successfully defended his IBF world heavyweight title, but the night started off with a hard hitting middleweight bout. Chris Eubank Jr (23-1, 18 KO’s) defeated Tom Doran (17-1, 7 KO’s) by 4th round KO, and held on to the British Commonwealth title. Eubank proved to have a very strong chin, and Doran was way overmatched in the power and speed department. After the fight, Eubank called out the man himself “GGG”, declaring that he is ready to fight him. Matin Murray also took on George Groves in a Super Middleweight bout. Groves took the easy win over Murray in a lopsided unanimous decision with final scores of 118-110 on all three scorecards. In the main event, Anthony Joshua was making the first defense of his newly acquired IBF heavyweight title. It was a breeze for Joshua, as Breazeale offered almost no resistance. Breazeale showed off a great chin early on, as he was getting peppered with combinations. Joshua’s speed for a heavyweight is unbelievable, and Breazeale just could not handle it. AJ would settle down a bit in the middle rounds, and throw less pushes, perhaps not to tire himself out, bu was still hitting Breazeale at will. The end would come in the 7th round, when Joshua would land a huge right hand, followed by a left hook, which put Breazeale down for the count. Breazeale takes his first loss of his career, as Joshua successfully defends his title. Dillan Whyte — Win, TKO 7th round (12), 12/12/15. Fred Kassi — Win, Unanimous Decision (10), 9/26/15. Amir Mansour — Win, TKO 5th round (10), 1/23/16.